Last summer during the spat between U.S. President Donald Trump and his Turkish counterpart, Recep Tayyip Erdogan, the Turkish lira went through a spectacular meltdown. The public cause of this spat was Pastor Andrew Brunson, who Erdogan was holding as a political prisoner. The real reason for the spat was Erdgoan’s public announcement of his wanting to join the BRICS alliance after agreeing to buy S-400 missile defense platforms from Russia. After the lira spiked, doubling the exchange rate and hitting a peak of more than seven versus the dollar, Brunson was released. Since then the lira has calmed down. This week we saw the Turkish government crack down on all forms of shorting and selling the lira. Zerohedge has done yeoman’s work covering this story of credit spreads hitting insane levels. Can you say implied yields on Turkish debt of over 280%? There are vast bids for US 90-day T-Bills from around the world and no offers. The shortage in US government paper is now being reported to us from repo desks around the world. There is a MAJOR PANIC in to the dollar as emerging markets come under a financial crisis, in part, instigated by Turkey. Now, I’m not suggesting that lira weakness was all politically motivated, that would be silly. But I am saying where there is smoke there is fire. Because what instigates this type of move by Erdogan now after eight months of relative calm? Yes, the lira weakened last week, but it was nothing major. Turkey’s crisis spooked a lot of people last summer. Turkey’s persistent current account deficit is a big problem. But its bigger problem is the more than $200 billion in dollar-denominated debt owed by its corporations, much of which is held by European banks. A decade of ZIRP – Zero Interest Rate Policy and NIRP — Negative Interest Rate Policy — in the West saw emerging markets, like Turkey, load up on debt payable in dollars and euros versus the native currency. Italian banks, for example, starved for yield — because of the ECB’s NIRP policy — bought loads of this high-yield Turkish debt to shore up their cash flows as net interest margins collapsed. The lira was always susceptible to a run like what happened last year. But in geopolitics, timing is everything. So conditions were ripe for a little hybrid warfare to try and bring Erdogan to heel over issues like Brunson, as well as supporting U.S. plans in Syria and its growing economic ties in energy and defense with Russia. They get to attack Turkey’s solvency to cripple Erdogan politically while also reminding the EU just how fragile its banking system is. Trump used this as leverage in talks when he went to last summer’s NATO summit. However, by surviving the attempt to blow up the lira last year, Erdogan is in a stronger position now than he was then. He survived because both Russia and, more importantly, China funneled much-needed dollars into Turkey to help smooth the situation out and assist companies in reissuing the debt in lira or yuan, or simply paying them off completely. With local elections coming up he may have triggered the markets into a spasm to remind everyone the basic verity of fractional-reserve banking. When you owe the bank $1,000 it’s your problem. When you owe the bank $200 billion dollars it’s the bank’s problem. It’s a dangerous game — if it is, in fact, what Erdogan is doing. Turkey’s foreign exchange reserves are dangerously low, and he’s burned through a third of them this week alone. But at the same time, he’s also categorically ruled out an IMF bailout. Rightly calling the IMF effectively loan sharks. And that means that he could be pushing this to the point of a massive debt default. There is, after all, little difference, at the margin, between genius and madness. That would have enormous knock-on effects on European banks already teetering due to a falling euro. ECB President Mario Draghi announced a tiered-rate euro system for euro-zone banks to help combat their lack of profitability. Deutsche Bank (NYSE:DB) needs to raise $10 billion to even complete the merger the German government is forcing on it with Commerzbank. How are they going to do that with a market cap of just $16 billion? Meanwhile, the EU is in the fight for its life with Brexit. Italy has one foot out the door and the European Parliamentary elections promise to see national populists and Euroskeptics more than double their representation to more than 30 percent. So any cold that Italy catches thanks to Turkey will be given directly to Germany as well. 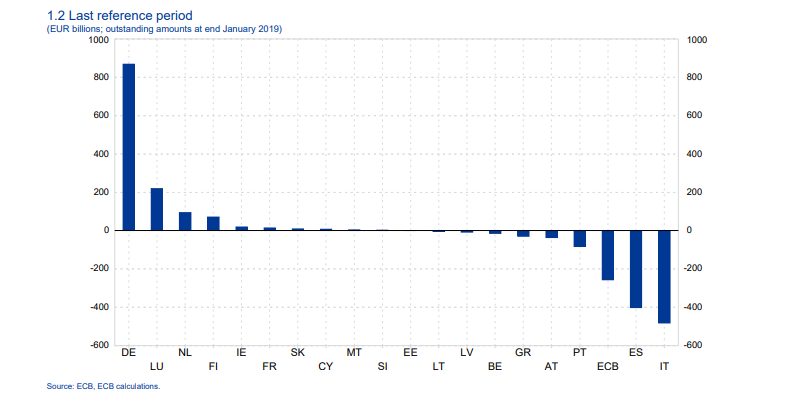 After all, it is Germany that has funded Italy’s budget deficit for years, as shown by the massive TARGET 2 imbalances. Think of this as Keynesian herpes. I don’t know for sure what’s happening here but I do know that the U.S. is playing hardball on anyone who is maintaining any economic ties to Iran, criticizing Israel and/or backing President Nicolas Maduro of Venezuela while we try and regime change him. Turkey is doing all three of these things. And the combination of U.S. anger at Turkey’s sliding into the BRICS orbit, Turkey’s indebtedness and EU contagion risk creates a potentially explosive situation in credit and currency markets that Armstrong is now warning could become ground zero for the next financial crisis. Throw in a U.S. Treasury yield curve inversion which now sees the 10-year note trading below the Fed’s benchmark rate, and we are simply not in Kansas anymore. The real story here is that these events are intertwined with the changing political landscape and the limits of debt to fund growth. Turkey was our canary in the coalmine last year in that emerging markets were over-exposed to rising U.S. interest rates. It is again now. And what we’ve seen is a massive flight into the dollar despite the Fed rolling over last week. The U.S. Dollar Index is threatening a big breakout above 98. The only thing keeping it in check is the daily head-fakes coming out of Brexit negotiations, which keep both the pound and the euro range-bound. Gold has backed off of a major breakout as dollar liquidity seems to be drying up, but is clearly under accumulation between $1,275 and $1,325. There could be short-term weakness in bullion if things get any tighter in the U.S. treasury market. But with Basel III rules going into effect on Monday, gold becomes a Tier I asset. So, if there is no collateral available for banks in the form of short-term U.S. paper, then some of that demand may shift to gold. It is likely why gold has held up as well as it has despite growing dollar liquidity concerns. I have some of the stuff. Do you? • Money & Markets contributor Tom Luongo is the publisher of the Gold Goats ‘n Guns Newsletter. His work also is published at Strategic Culture Foundation, LewRockwell.com, Zerohedge and Russia Insider. A Libertarian adherent to Austrian economics, he applies those lessons to geopolitics, gold and central bank policy.